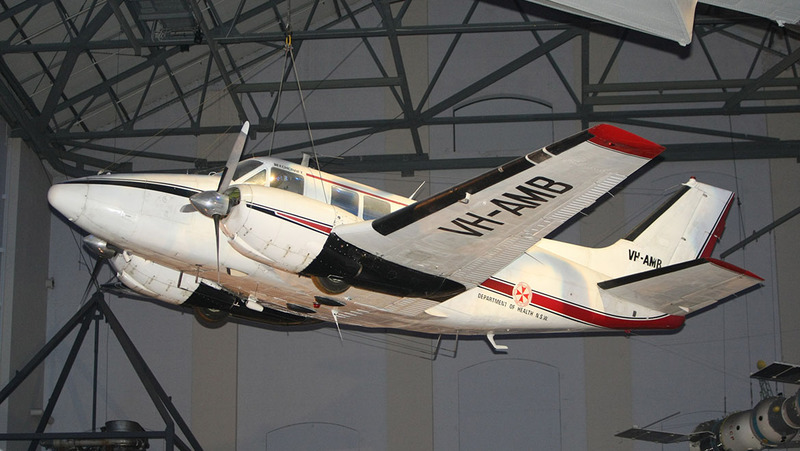 Hanging from the roof of Sydney’s Powerhouse Museum is an array of aircraft that are significant to Australia’s aviation heritage. The Bleriot monoplane that conducted the country’s very first airmail flight and P G Taylor’s Catalina Frigate Bird II that conquered the South Pacific between Australia and South America. Lesser known and lacking the same dramatic lines is a Beechcraft B80 Queen Air, registration VH-AMB. Its markings of red and white leave little doubt of its heritage as an aerial ambulance, although the fact that it flew 24,500 hours over a distance of close to 3,855,000 nautical miles is far less obvious. 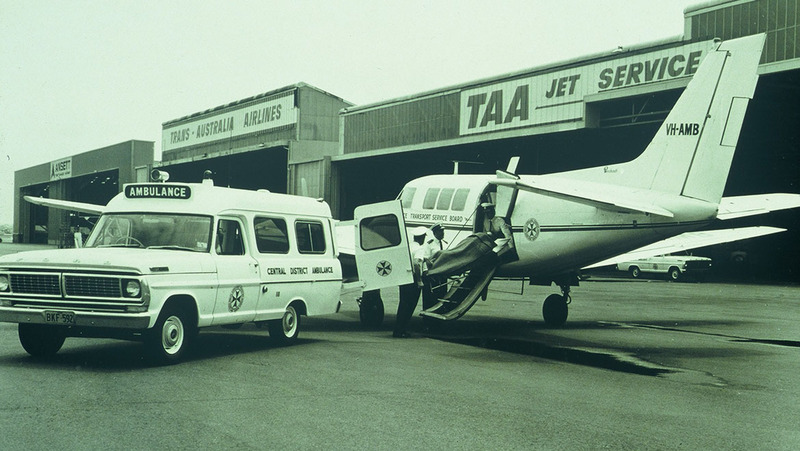 This discreetly positioned Queen Air was a pioneer of the NSW Air Ambulance, a service that now marks its 50th year. Australia is known as a pioneer of aeromedical operations. The Royal Flying Doctor Service’s history extends back to 1928 when the Reverend John Flynn first began providing medical care for remote, rural communities. It is a service whose reputation has now reached far beyond Australia’s shores. Over the ensuing decades, further services began to provide for regional communities in NSW, but like the road ambulance, they were not unified under any single umbrella. Individual districts under the direction of localised committees controlled their respective operations. By 1960, over 300,000 patients had required ambulance transport and the need for aerial transfer was also growing. Ultimately, through a series of tragic accidents and events, it became increasingly apparent that a co-ordinated service was needed beyond the routine clinics and transport to smaller regional base hospitals. Critical cases required timely transfer to major hospitals in a manner that only an organised aerial service could provide. When it came to finding an operator for the air ambulance, there was no shortage of interested parties including, at one stage, Qantas. However, at the time the airline was seen as an international carrier and would have required the permission of state governments to operate a domestic service and this was seen as highly unlikely. Ultimately, in July 1966 when the tender process closed, the successful applicant was the Tamworth-based East West Airlines. A fund-raising appeal had been running for some time to finance the purchase of an aircraft and with the available funds, a Beechcraft Queen Air was chosen. Ferried to Australia from Kansas, the aircraft arrived at Sydney in November 1966. The aircraft was highly modified for aeromedical purposes with piped oxygen and the ability to cater for respirators, humidicribs and blood transfusions among other tasks. The official handover of VH-AMB took place in the following February and fittingly, Nancy-Bird Walton was in attendance. Entering service in March, the Queen Air was flying around the clock from the very first week with pilots, flight nurses and engineers kept busy. In its first year, the sole aircraft had flown nearly 2,000 patients across more than 600 missions, chalking up 2,100 hours of flight time. Demand increasingly outstripped supply and the process began again in order to acquire a second aircraft, including the need for public subscription to fund another Queen Air. The majority of the funds were raised by the NSW Bowling Association and VH-AMG came into service in 1970 and in time it was followed by AMQ, AMD and ultimately AMS. Over time, the carriage of patients was refined and new equipment introduced to meet the specialised needs of transporting stretcher-bound patients. The hydralift trolley was one such device which came into service in 1973. A mobile ‘scissor lift’, it was kept at country airports to elevate stretchers to a level that they could be loaded onto the Queen Air through the aft double-doors which were fitted to later aircraft. This was achieved by the ambulance officer pumping a foot pedal until the desired level was reached before the stretcher was tethered to rails within the aircraft and manoeuvred into position. The entire exercise was challenging given the confines of the cabin, the instability of the apparatus and the variables of weather. Still, it served a vital role for many years. For East West Airlines, the Health Department contract was a substantial one and it did come with a number of requirements, not the least of which was the experience requirements for pilots. Critically, the nature of the contract called for substantial night flying experience and precluded a number of applicants from being able to serve with the Air Ambulance, even though their experience satisfied the criteria to fly in the airline division as a first officer. The flying was comprised of routine ‘milk run’ type operations and critical care emergency operations at all hours. Pilots had both scheduled flights and ‘standby’ duties which could be served at home as long as they were able to have the aircraft airborne within 90 minutes of being called out. In the days before mobile phones, this requirement had pilots tethered to their landline, although some invested in the cutting edge technology of pagers. The pilots wore the full East West Airlines uniform, complete with hat, although the bars on their sleeves and epaulettes were about half the width of their airline counterparts. Additionally, as part of the airline’s General Aviation Division, selected pilots also flew the CSIRO DC-3 on such duties as the Interscan microwave landing system trials. 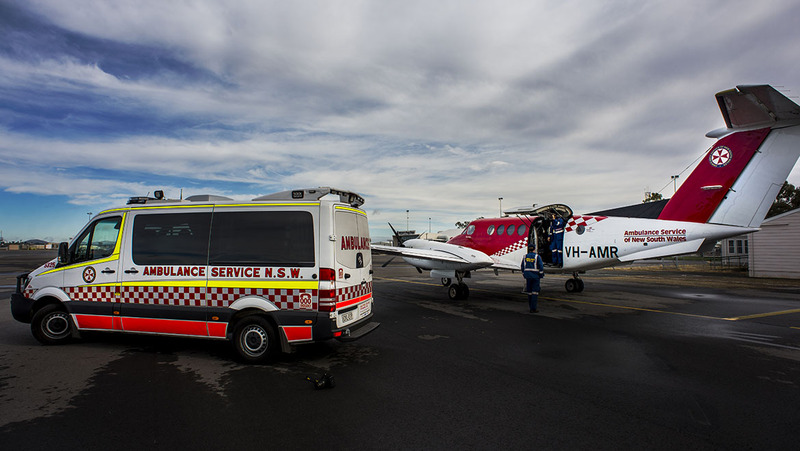 Across the industry, a NSW Air Ambulance position was coveted by pilots, although turnover was limited to younger pilots moving through to the airline while the highly experienced older hands remained. By 1985, VH-AMB was near the end of her days and on July 26 she was ferried for a final time from Tamworth to Sydney before being relocated to her new home at the Powerhouse Museum. In 18 years of service, VH‑AMB transported over 32,000 patients, carried out 26,150 landings and underwent 39 total engine changes and two wing spar repairs. AMB and the other Queen Airs had served the role well, but they did come with limitations. Not being pressurised, the aircraft was forced to fly below 10,000 feet, through much of the weather and in the midst of icing conditions, day and night. At the mercy of the lower altitudes, climbs and descents needed to be managed carefully as did the relative oxygen levels for the patients. With this realisation, a move was made towards a replacement aircraft in the form of the Queen Air’s big brother, the Beechcraft Super King Air 200.
xThe King Air allowed patients to be transported in the flight levels, above most of the weather. Additionally, the cabin altitude and rate of climb was managed by the pressurisation system. The arrival of AMM and then AMR marked the beginning of the fleet’s transition. In the ensuing years, East West was replaced as the service provider after 20 years with Skywest and Pearl Aviation filling the role. 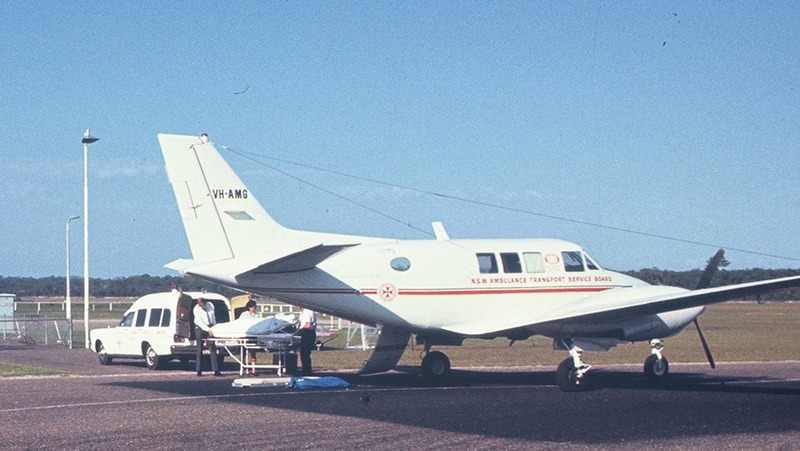 Then in 2003 the current provider, the Royal Flying Doctor Service, commenced operations. Somewhat incongruously given the name RFDS, the NSW Air Ambulance has never been in the business of routinely carrying doctors. 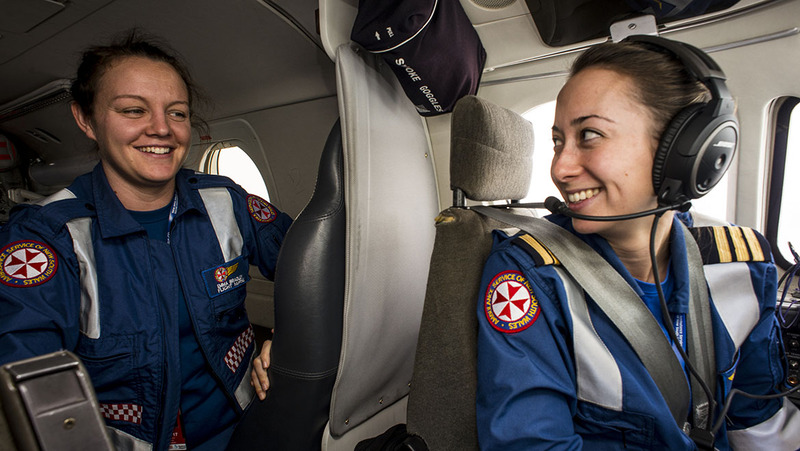 Originally known as ‘flight sisters’, the majority of missions are carried out by a highly-qualified and specialised flight nurse/midwife, who is the sole clinician on board. All flight nurse/midwives have a minimum of five years postgraduate care and hold dual registrations in both nursing and midwifery. They must also have extensive experience or tertiary qualifications in a critical care area. Additionally, they are certified cabin attendants, meaning that they undergo annual emergency training and certification in the carriage of dangerous goods, ditching and firefighting. This is aided by a training facility upstairs at the Sydney Airport base where a full cabin mockup of the King Air allows realistic scenarios to be recreated. 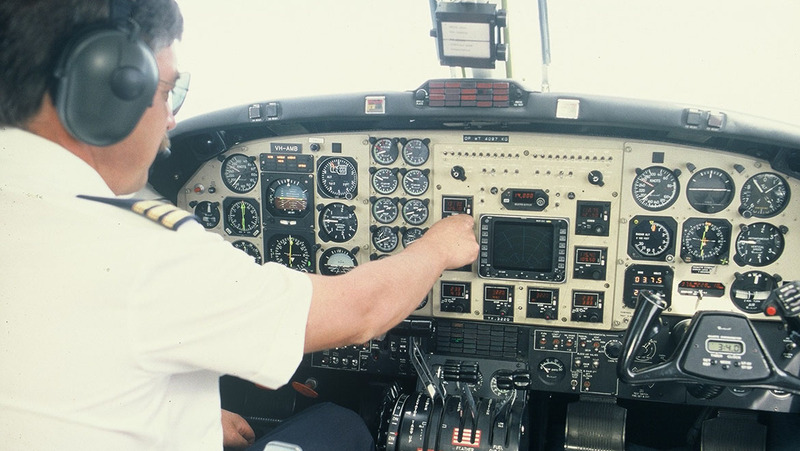 Similarly, the pilots are highly qualified before they even take a seat in the King Airs, equipped with an impressive Rockwell Collins Proline 21 avionics fitout. To apply they require 3,000 hours in command including 2,000 hours command on multi-engine aircraft, plus 500 hours of night flying and 500 hours of turbine time are also needed as is a minimum of 150 hours instrument time with four rating renewals – such are the demands of this 24-hour, single-pilot operation. It is a far cry from the lone Queen Air and three flight sisters of 1967. 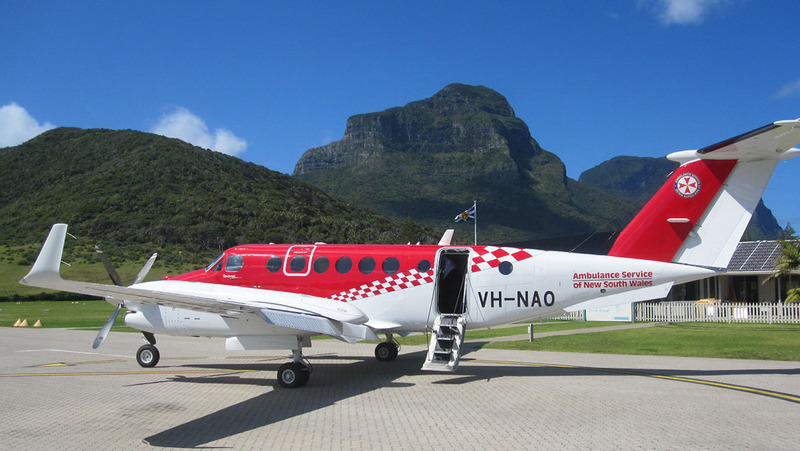 Today the NSW Air Ambulance operates five aircraft in total, comprising three King Air 200s and two King Air 350s. They are crewed by 25 pilots and 40 flight nurse/midwives, while on the ground there are 13 engineers and further support staff keeping the aircraft flying. There are four main categories of mission: emergency care, for those who have experienced significant trauma, cardiac conditions and other serious medical conditions; scheduled care, for patients transported between facilities, but not in an emergency situation; critical care, for patients who require considerable intervention to maintain their health, including invasive devices, or may be in an induced coma on life support. Some may be transported in conjunction with a NSW Ambulance specialist doctor; and finally, specialised care. These are highly specialised cases which require significant innovation and adaption to enable the patient to be transported by aeroplane and may include such patients as those on cardiac bypass machines. There are also missions in conjunction with the Newborn and paediatric Emergency Transport Service (NETS) to transfer critically ill and injured babies and children. This wide-ranging service is maintained around the clock by 10 10-hour shifts, providing unlimited coverage while still accounting for the restrictions of flight and duty times. Gone also are the pagers and standby duties from home and one would severely doubt the feasibility of a 90-minute call-out given Sydney’s 21st century traffic. Standby crews fulfil their obligations at the airport. The hydralift system has also been replaced by a finely balanced, state-of-the-art loading system that allows for seamless entry and exit from the aircraft. Comparatively effortless compared to the old system, the physical strain of loading stretcher patients has seemingly all but disappeared. The network has transformed over time as well. There are more interstate transfers than were once the case. Also, although the entire state is still provided with excellent coverage, today a greater percentage of flying is to ports serviced by a regional base hospital than when the Queen Airs plied their trade. A mission is considered to be the round trip returning to Sydney and can include up to six sectors. With this in mind, the statistics from 2015 emphasise the reach and complexity of the NSW Air Ambulance operation. In that year, it flew 2,807 missions, 7,021 flight hours and transported 5,021 patients. It is a far cry from Nancy Bird’s Leopard Moth. While the Queen Air hanging from the museum roof may not possess the impressive wing span of some of those in its company, or the mystique of a fabric-covered monoplane, its place in Australia’s aviation history is no less deserving. For that white Beechcraft with its red stripes served many in need on cold, dark nights when help would have once been so far away. It may have not spanned oceans, but it saved lives – perhaps more than we will ever know. If only those wings could speak. Today’s Throwback Thursday feature article first appeared in the January-February 2017 issue of Australian Aviation. To read more stories like this, subscribe here. Digital editions of the magazine can be purchased on Zinioand Issuu, or in the Apple app store.